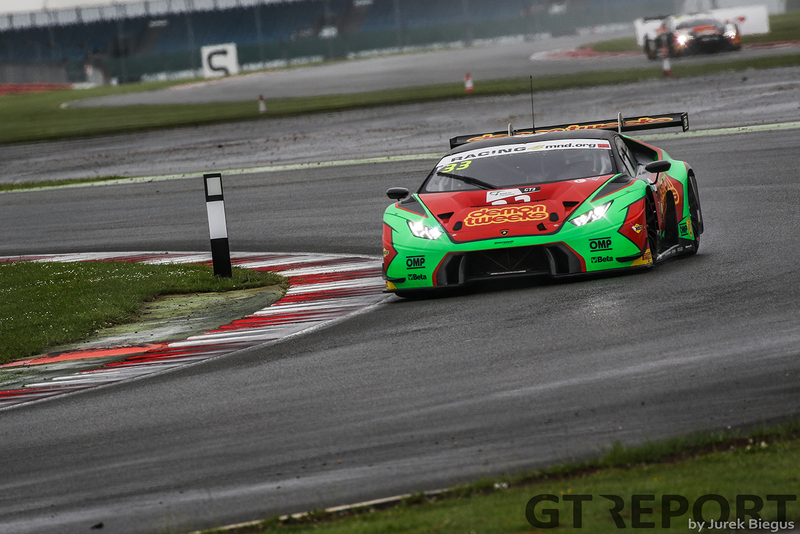 Another strategic play by Barwell Motorsport saw Jon Minshaw and Phil Keen take a long-awaited maiden win in British GT Championship’s Silverstone 500. The Surrey-based group was victorious in a three-hour race that was marked by heavy rain alternated with sunshine and drizzle, which opened a window of opportunity for those who were willing to roll the dice with a daring pit stop strategy. 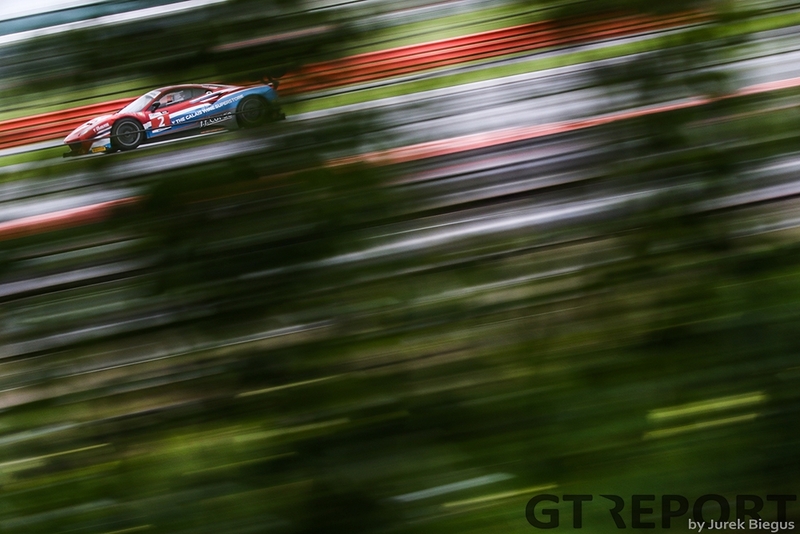 Relying less on strategy and more on an extremely high-paced sprint for the finish on a drying track were second place finishers Lee Mowle and Joe Osborn in the AmD BMW Z4 GT3 and third placed Adam Carroll and Marco Attard in FF Corse’s brand-new Ferrari 488 GT3. Confirmation bias tells us that it always rains in England and that’s exactly what it does when the teams make their way to the grid for British GT’s blue-ribbon event. The skies are dark and it’s been poring rain all morning. 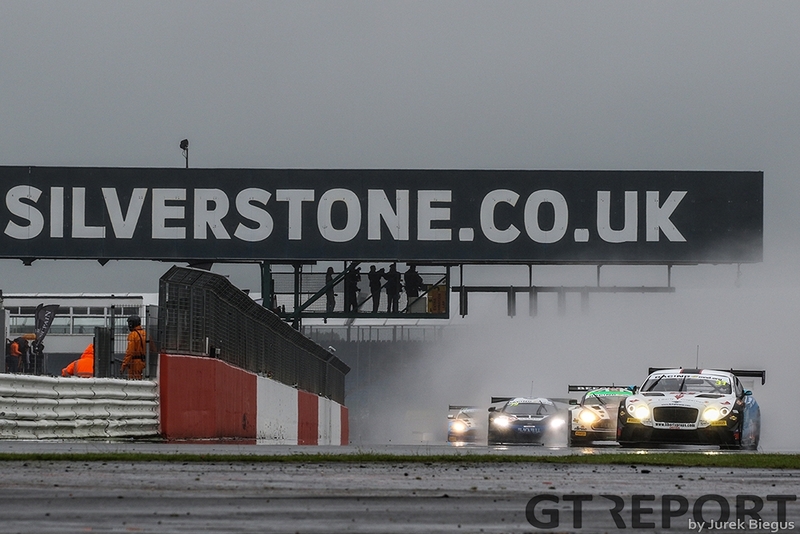 The Team Parker Racing Bentley Continental GT3 squad went fastest yesterday in qualifying, two weeks after bringing the British marque its very first race win on home soil. Perhaps still bullish after this historic win, or maybe simply caught off-guard, Rick Parfitt Jr. spins the big Bentley around on his way to the grid. Without damage done he continues to find his spot at the front of the field. The Brit now knows what to expect. Just as the cars leave the grid for the warm-up lap, the heavy rain has stopped and is replaced by a drizzle. The wet and slippery track surface still offers enough traps for the 51 car strong field, so race control deems it saver to start the race behind the safety car. Under these few laps of caution several teams switch up the game by making their first of three mandatory pit stops only minutes into the race. As the race is only three hours long, four stints is one stint more than necessary. 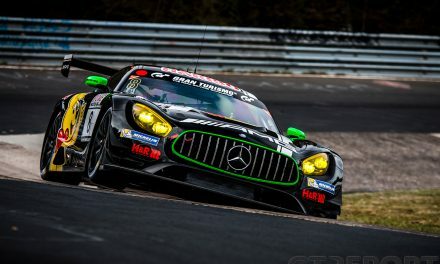 Taking out their amateur drivers and handing over the car to the professionals to take on the treacherous conditions without losing much time as the field laps the track at safety car speed, would prove to be a pivotal move later on in the race. Spending the mandatory minimum time in the pits, the Tolman Motorsport Ginetta G55 GT3 of now Mike Simpson and all three Barwell Motorsport Lamborghini Huracán GT3s return to the track far back in the field. Their moment to shine will come later. 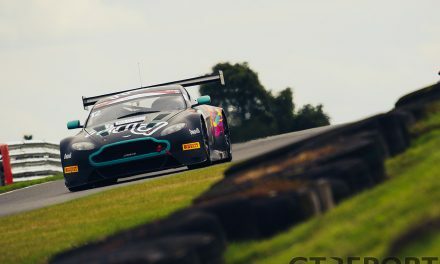 First it’s up to championship leader Derek Johnston in the TF Sport Aston Martin V12 Vantage GT3 to take the lead. He’s been chasing Parfitt for the first couple of laps after the race went green, being at an arm’s length of the sliding and drifting Bentley, but it takes traffic to get Parfitt out of his rhythm and for Johnston to go past. Despite his solid pace in the opening laps, Parfitt can’t stick with Johnston and is soon swallowed by the group of frontrunners. Johnston, on the other hand, is not showing any sign of being the Am-classified driver in TF Sport’s number 17 Aston Martin Vantage line-up and is driving away from his pursuers. By now a damp racing line is starting to appear, but off-line the track is still very wet and slippery. It’s there where Johnston makes his fatal mistake. 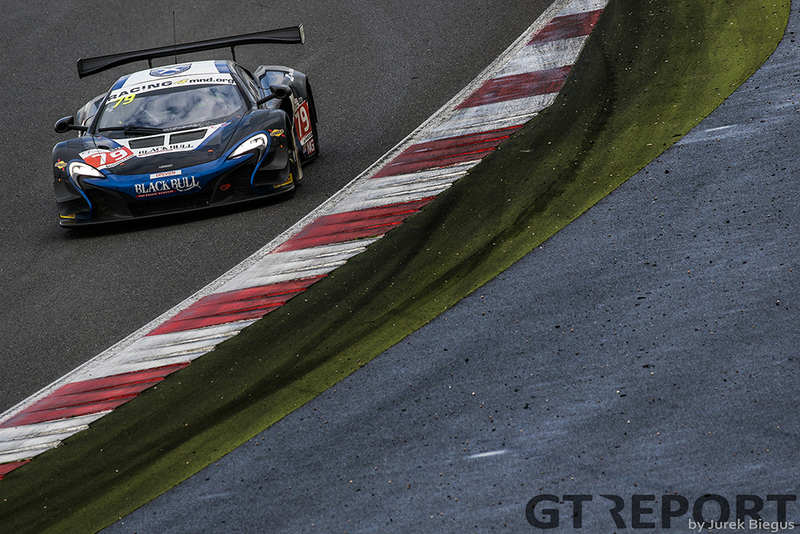 Running wide at Maggotts-Becketts while lapping GT4 traffic, the Vantage loses grip and clips the wall. The hit isn’t very hard, but it’s just hard enough to damage the suspension. It’s race over and points gone for championship leaders Derek Johnston and Jonny Adam. Barwell is still going strong. Up against mainly Am drivers, Alexander Sims is in the number 6 Barwell Lamborghini and has made his way to the front to take the lead behind the safety car that has again come out onto the track. The moment is perfect for Barwell to bring in its cars for their second pit stops of the race, along with the cars that are still in their first stint. Sims hands the Huracán back to Liam Griffin, who was assigned to do the initial start only to step out minutes into the race. Halfway through the race it all falls apart for Griffin and Sims when the Am driver, through no fault of his own, is suddenly caught up in the mess of a European GT4 car and receives a hard blow, damaging a lower wishbone and track rod. Up until that point the duo was closing in on the final push for the team’s second win of the season, with the last stint coming up soon and Sims ready to take over. After crawling back to the pits, a furious Griffin is forced to retire the car. Barwell’s other Lamborghini is left to defend the team’s honour. 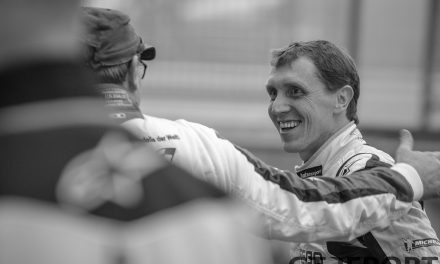 Owing much of its performance to being on the same strategy as Griffin and Sims’ car, the number 33 Barwell Lamborghini of Phil Keen and Jon Minshaw has never been too far away from Griffin and Sims. When the last hour arrives, Keen starts his final ascent. He starts reeling in the two leading Tolman Motorsport Ginetta G55 GT3s that are still far away but stuck with wet-weather tyres on a drying track. Onward to his very first British GT victory, the 33-year-old takes the lead as he shoots past the Ginettas with half an hour to go and never looks back. His pursuers are Optimum Motorsport Audi R8 LMS GT3 driver Ryan Ratcliffe, Joe Osborne in the AmD BMW Z4 GT3, FF Corse’s Adam Carroll in the brand-new Ferrari 488 GT3 and McLaren works driver Rob Bell, who’s competing in the British championship with Ecurie Ecosse in the McLaren 650S GT3. The latter three are cutting through traffic at a relentless pace, fighting each other for the last two steps on the podium, while Ratcliffe is slowly losing speed as his old tyres are starting to wear down. After several intense laps, Carroll eventually has to yield to Osborne, who has now set his sights on taking second place away from Ratcliffe. The Audi driver is losing grip rapidly, making him easy prey if only Osborne can close the gap before the time runs out. Just minutes before the end the BMW catches up and smelling the blood of the wounded Audi, Osborne moves in for the overtake and takes second place away from the young Welshman. Carroll, meanwhile, is still duelling with Bell. 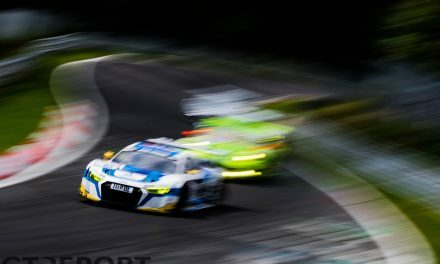 It’s a battle where no punches are pulled and fourth place might very well turn into the podium, for Ratcliffe’s Audi is close-by and will be passed before the finish flag. With Ratcliffe also falling victim to Carroll and Bell’s speed, the battle reaches its climax on the final lap. For a second the McLaren takes third place away from Carroll, but the Northern Irishman puts all of his might behind reclaiming the spot. Carroll manages to keep his position, and brings home a podium result in the very first British GT race for the Ferrari 488 GT3. “I don’t think I had any pace for Joe [Osborne],” Carroll evaluates. “I didn’t seem to have too much left on the front tyres. It probably was because I was pushing hard at the start [of the stint], or because of going through the cold cycle, or maybe it was just our set-up, or whatever happened, they just seemed to go away. The stars of the middle part of the race are unable to carry their performance over into a podium result. Like Barwell, the number 32 Tolman Ginetta G55 GT3 of Ian Stinton and Mike Simpson goes for the alternative strategy, replace Stinton with Pro pilot Simpson in the opening minutes. When the other cars make their first pit stops during the second full course yellow, Simpson leapfrogs to the front of the field and leaves everyone behind setting fastest race lap times. Luke Davenport in the number 56 sister Ginetta is taking a more conventional pit stop approach, but he, too, has found his way to the front and will eventually take hold of the lead. Going into the final hour, Tolman is gambling on the newly-arrived rain to continue until the end. But that doesn’t happen. The Tolman crew has had a strong run, stronger than any other Ginetta squad has had in many years, remaining flawless when others made race-ending mistakes. Going back to green, the rain is gone and on threaded rubber the duo is losing their enormous lead in mere laps. Stinton and Pattison struggle on to reach their final pit stop window but by then it’s too late to fight for the victory. 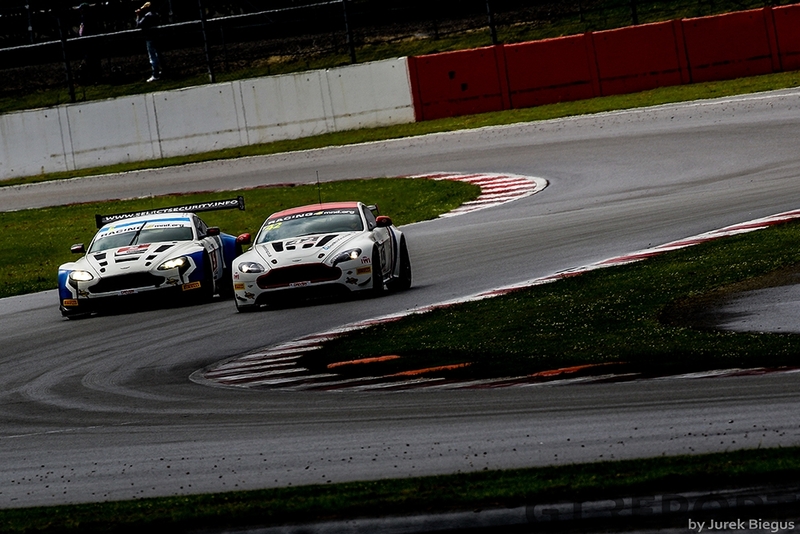 In GT4, the British teams had to share their class with the GT4 European Series, where driving standards were less than desirable, resulting not only in penalties, but direct involvement in the outcome of the overall race as well. 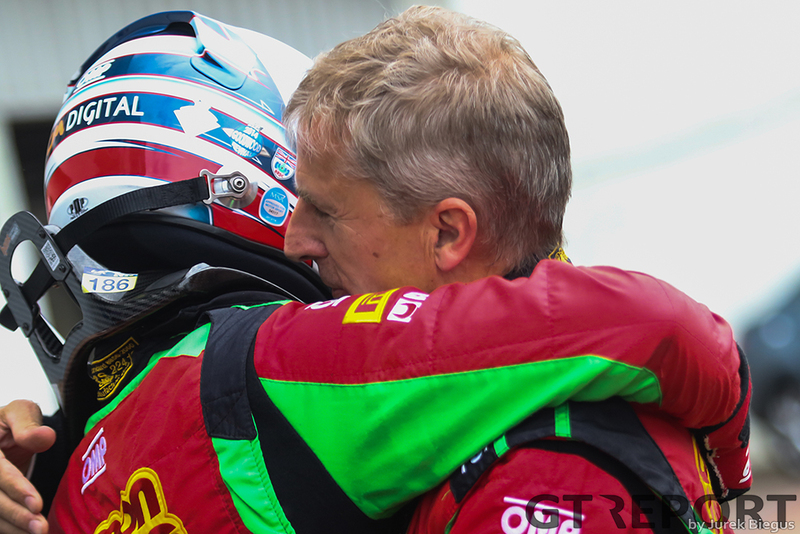 Aaron Mason and Rob Barrable took their Tony Gilham Racing Ginetta G55 GT4 to the win in British GT4, closely followed by the two PROsport Performance Porsche Cayman GT4s competing in the European GT4 championship. It’s a long way to first place for the Irish-English tandem. Having to start from sixteenth in class, the RCBI Insurance-sponsored team makes the decision during the second safety car phase to avoid the crowded pit lane and wait one more lap to bring the car in for the day’s first pit stop. Giving the pit crew all the space for a quick service and helped by confusion behind the safety car, Barrable, who has taken over from Mason, emerges in the lead. 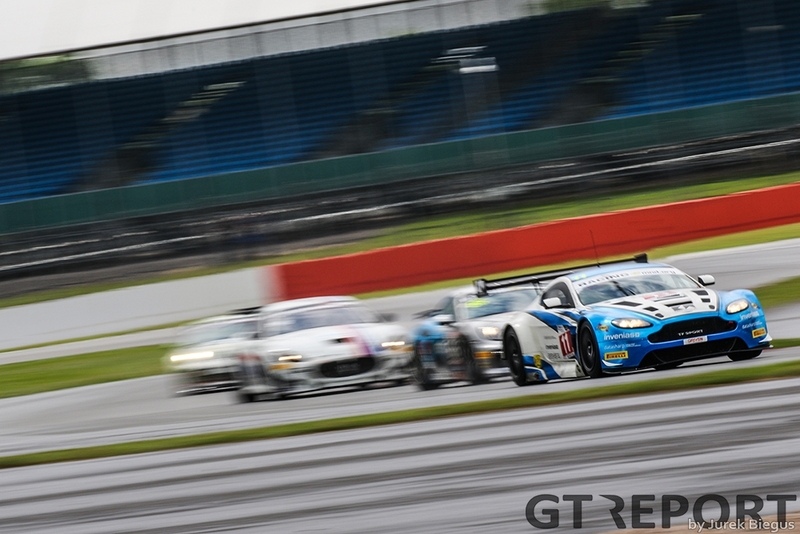 More superb stints follow and delaying their last pit stop to weather the final rain shower, brings Mason and Barrable their maiden British GT victory. 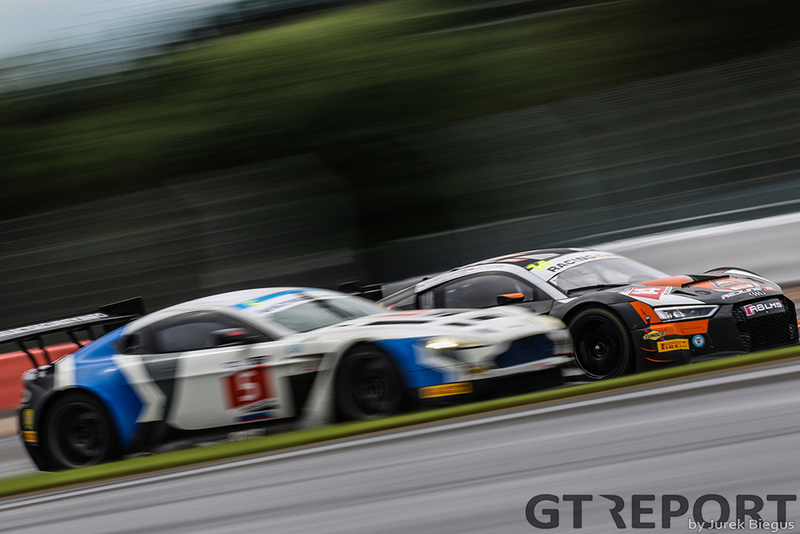 Despite much chagrin from the British GT competitors about many of their European GT4 colleagues, the two championships will team up again for the next round, a two-hour race held at Spa-Francorchamps on 9 July.